I just wanted to flash my new pretty little badge today. I am really flying high, as I move into this New Year. 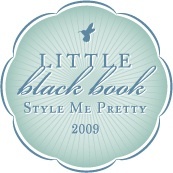 I earned this badge just as 2009 ended, and I will be a "Little Black Book" vendor with Style Me Pretty. I am so excited about the many new relationships 2009 offered and nurturing them in 2010 is going to be a blast. I am so charged for this year, I can't believe I am saying this, but I am ready to reach even higher. Sometimes I even exhaust myself. I love having limitless goals. Wait until you see what we do this year! I was looking at your amazing gallery and saw so many beautiful arrangements. I wanted to ask you about Jenny’s wedding. At the alter there were two flower arrangements but then there were long branches or flowers coming out of them that made an arch. Can you tell me what those are called? Ive never seen that done before and think its absolutely perfect! Thank you!